Norwegian band release their 5th album - Prog with a psychedelic aura! 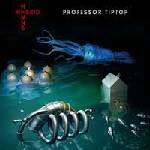 More information: Professor Tip Top from Bergen, Norway, are ready with their 5th album Hybrid Hymns! They are a group playing fine progressive music with a retro sound greased with a lysergic touch which gives the songs a psychedelic aura. The songs are partly melodic with vocals, adding longer instrumental parts of guitar, analog sequencers, vintage synths and keyboards in between. Inspiration and influences are the 60's / 70's versions of Gong, Yes, Pink Floyd, and the Canterbury scene. The band started in 2011, but the members are veterans with musical backgrounds starting in the early 70's. The lyrics are written by the singer Svein Magnar Hansen. For fans of Pink Floyd, Gong, Yes, Alan Parsons Project and Camel.